For comparisons to AERONET data, all retrieved satellite aerosol optical depths are averaged spatially over regions of 1deg latitude by 1deg longitude (about 100km by 100km) and temporally over a month or season. All aerosol optical depths are scaled to a common mid-visible wavelength at 0.55 |j,m, based on local statistics for the AERONET Angstrom parameter (see Figure 3). 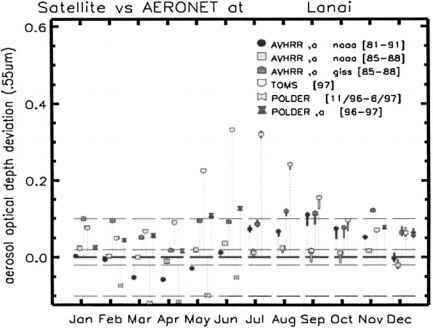 For a local comparison to AERONET-site statistics, the monthly averages of the 4 grid-points closest to each AERONET-site have been interpolated (with inverse distance weights). 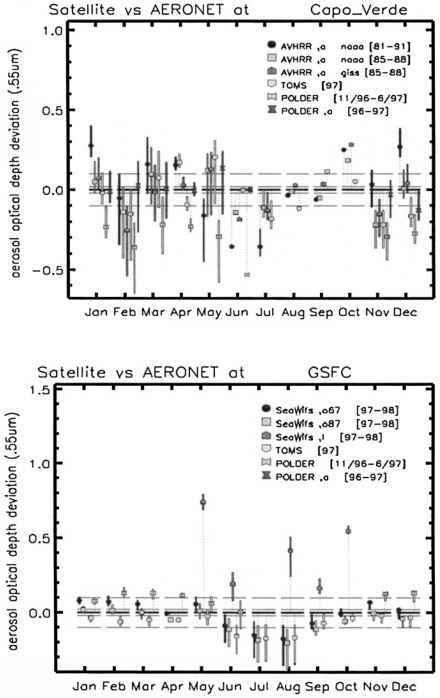 Aerosol optical depth differences of satellite data with respect to the AERONET statistics are summarized on a quarterly basis in Tables 4 and 5. Table 4 illustrates, in reference to the AERONET statistics (Figures 3), differences in mid-visible optical depths for the two NOAA-9 based AVHRR retrievals, which are limited to near ocean sites, for two global retrievals with TOMS and POLDER and for a SeaWifs land-retrieval (employing an AVHRR dark pixel mask and cloud-screen). It should be stressed that the POLDER and the combined SeaWifs/AVHRR retrievals are highly experimental. Table 5 illustrates, in reference to the AERONET statistics (Figure 3), difference of other satellites retrievals for near-ocean sites. It includes a NOAA AVHRR data-set for an extended time-period, a conventional (not polarization based) POLDER retrieval and a few samples from SeaWifs and OCTS single channel retrievals. Deviations of Tables 4 and 5 are supported by a more detailed satellite comparison of monthly (rather than quarterly) averages, however only for the four sites of Figures 2, in Figures 5. Vertical bars over each symbol reflect the uncertainty of AERONET monthly averages based on the detected year-to-year variability (see Figures 2 and 3). 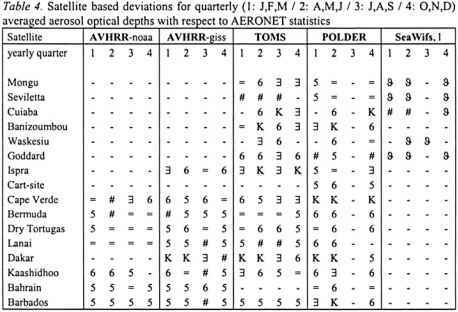 AERONET statistics (if aerosol optical depths were retrieved at wavelengths other than 0.55|im). Deviations to multi-year AERONET averages (large symbols) and deviations with respect to the year-to year range of AERONET monthly averages (vertical bars) are provided? Quarterly averages for the mid-visible aerosol optical depth are rarely found to agree within +/- 0.02. This does not surprise, given spatial variability, sampling/screening biases and retrieval assumptions (even though a better retrieval performance may have benefited from partially offsetting biases or assumptions). For that reason the discussion will focus on cases, when the disagreement exceeded +/- 0.1 for the mid-visible aerosol optical depth (solid arrows in Tables 4 and 5). An initial glance at these results indicates that over (deep water) ocean, even very simple aerosol retrievals can be accurate to within +/- 0.1 for mid-visible aerosol optical depths. If shallow water retrievals except for dustsites, where, mainly due to problems with cloud-screening, retrievals under-predict aerosol optical depth. Over land accuracy for aerosol optical depth retrievals remain a problem.